It’s a really good question. You’ve got limited time, limited staff and a limited budget. Wouldn’t you love to have a tool to be able to look up a name, push a button and get a perfectly-honed strategic research profile on that exact person? Yeah, me too. I’m really sorry; it doesn’t exist. There is no push-button profile. Although I’m sure the good people at IBM are looking into ways to maximize Watson beyond Jeopardy! Until then, there are subscription services to multi-database products designed to get as close as possible to this ideal. 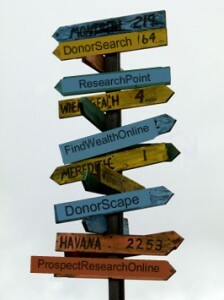 In alpha order, the largest services operating in this space are: DonorScape, DonorSearch, FindWealth Online, Prospect Research Online and ResearchPoint. These products represent a portion of what I consider the Swiss Army Knives of the prospect research world. They package as many different databases as possible to help with the variety of wealth-and-philanthropy information needs of the typical development office. Most of these vendors also provide electronic screenings of your database, but you aren’t required to do a screening with the company to purchase access to their look-up service. First, visit the vendors’ websites and spend 15 minutes familiarizing yourself with each company’s offering. You will notice some similar databases and features as well as some differences. Many of the vendors have pdfs with further information for you to download or print. If you’re a paper person, create a grid. If you’re a computer person, try Evernote or Zotero, two very cool tools for saving, filing, and creating notes online. Now that you’ve gotten an overview, call the vendors of the products you’re most interested in. Arrange for all of the product demonstrations to happen on the same day. Why? a) You will begin to form opinions quickly based on what you’re seeing from one product to the next in that short period. b) If you ask, most of the vendors will provide a week’s worth of access to test their product after the demo, and you will be able to test them out side-by-side in the week ahead. At this point I would recommend not asking about pricing. You want the best product for you, not just the cheapest. The one you select may actually end up being the least expensive, but don’t let that be a factor – yet. Do the exact same searches across all of the products, entering names of donors and volunteers you know very well and those you don’t know well at all. Ten to fifteen of each group should give you the information you’ll need to make a solid decision. Which had the easiest interface for you to use? Which was the most confusing? Which gave you the most information? The least? Which gave you the most accurate information based on what you already knew about your insiders? Which gave the most false hits? How easy is it to build and store lists? How much information do you need to know generally? How much time do you have to sift through information? What questions about prospects will you need to answer over the coming year? Usually at this point a fairly clear ranking is emerging on the decision grid. If you’re ready to buy, now it’s time to call the sales rep(s) to get pricing for your top one(s). DO: Ask for and call three references. How responsive is the vendor’s customer service? What do they love about the product and what do they find frustrating? DO: Find out if a professional association you belong to has negotiated any special discounts with the vendor to maximize your budget. DON’T: Just go with the service your best friend likes. Your organizations may be similar, but your situation is completely different from theirs. And there you have it – the very best prospect research Swiss Army Knife lookup service. You knew I was going to say this all along, didn’t you – it’s the one that’s best for you. Note: I have specifically omitted tools like Lexis Nexis, Dialog, Factiva, Highbeam, Morningstar and others from this article because I consider them in a different category of information aggregators. But you can still use the techniques I’ve described above to determine which of those resources would be best for you, too.